EureScribe is a transcription software system that attempts to make transcription of any audio and video files fast and easy. It does this by basically breaking down media files into small chunks that you can memorize easily. Everything you need to use to EureScribe is accessible through keyboard shortcuts so there's no skipping to and from the mouse all the time while transcribing, which saves a lot of time. 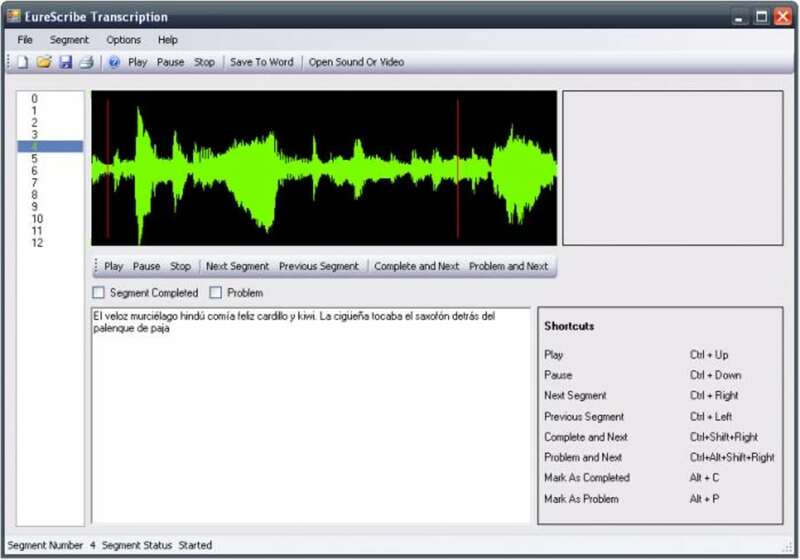 The final transcript can be saved in Word (RTF) format or as a subtitles video file if you're creating subtitles. EureScribe is extremely flexible in what it can handle, dealing with most major media formats such as WAV, .MP3, .WMA, .AVI, MPEG and DVD video. It comes in two editions - Personal and Workgroup. The former is designed just for individual projects and the latter for teams working on subtitling a project or film. If you're serious about adding subtitles or transcribing a script, then EureScribe makes the job more digestible. None. Wasn't even able to use the software. Doesn't even open.. Using to get a transcript from interview rushes. Didn't work. Didn't even open. What do you think about EureScribe? Do you recommend it? Why?